Below is the first of two articles about those three days of racing and also how one of the biggest scandals to ever hit the sport emerged as the race entourage made its way to Dublin. 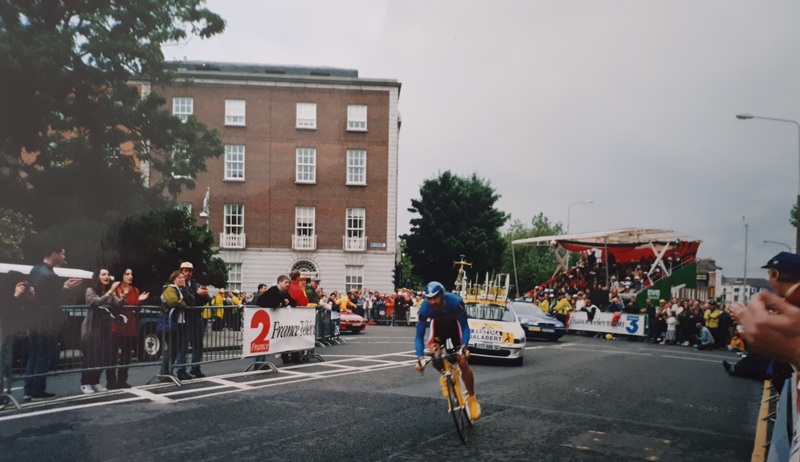 The Tour started in Dublin with a 5.6-kilometre prologue on 11 July followed by two road stages, a 180-kilometre stage starting and finishing in Dublin, and a 205-kilometre stage from Enniscorthy to Cork. Down through the years, the Tour has started outside of its homeland numerous times. The first ever foreign start in the history of the race was in Amsterdam in 1954, and since then it has started in locations including Brussels in 1958, Cologne in 1965 and West Berlin in 1987. Le Grand Départ, as the start of the race is known had always started on continental Europe so the idea of starting away from the mainland was particularly ambitious. In the mid ‘90s, an idea was hatched by race promoters Pat McQuaid, Mick Bennett and Alan Rushton to try and get the race to start to Ireland. This trio formed a company named L’Evenement to pull together a bid to submit to the Tour organisers, A.S.O., and if successful, it would be a massive undertaking. The two big names of Irish cycling, Kelly and Roche, had been approached by the race organisers to help with the bid. “When we first broached the idea the Irish government thought it was a joke. 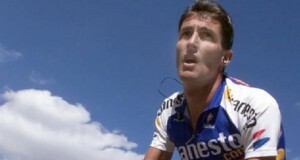 They didn’t take it seriously,” said Roche. “I don’t think if Kelly and me hadn’t been so high-profile it would have been possible.” A series of meetings subsequently took place between the two parties and A.S.O. eventually bought into the idea in 1996 for the start to take place in Ireland two years later. The exact route for the Tour in Ireland was announced in April 1997. 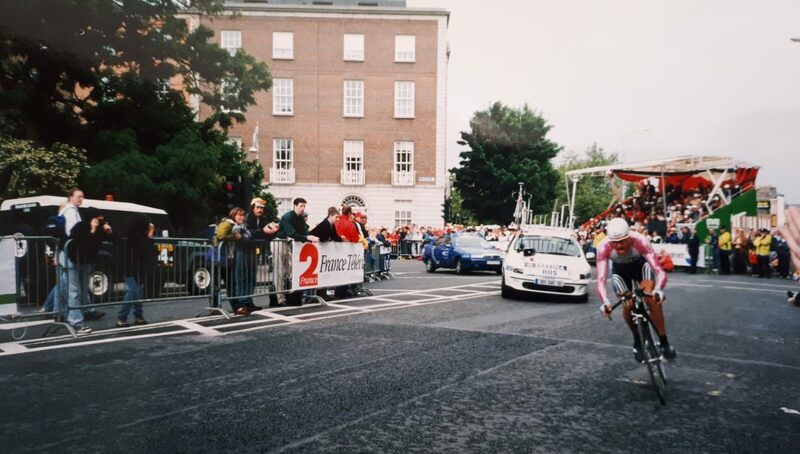 The Grand Départ would involve a 5.5 kilometre prologue time-trial in Dublin, followed by two road stages, a 180-kilometre route starting in Dublin, travelling through the Wicklow Mountains before finishing back in the capital, and then a 205-kilometre stage from Enniscorthy to Cork. 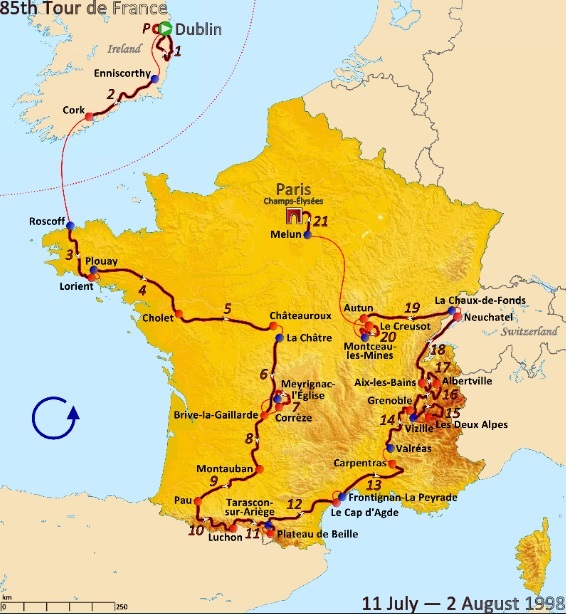 Following the stage finish in Cork, the Tour entourage would travel to France, with the cyclists flying and the bulk of the race personnel making the journey by sea. The Stena ferry line would divert three of its ships from their normal scheduled routes to help transport the numerous vehicles and staff to Brittany. McQuaid, who was also the head of the Irish Cycling Federation at the time said at the announcement: “Imagine the television pictures as the race passes through Glendalough, The Wicklow Gap, Blessington and the Phoenix Park. It will have to be one of the most spectacular starts ever to the Tour de France.” McQuaid claimed that the Tour would be the biggest ever sporting event staged in Ireland, and they expected the race to bring in £25m to tourism coffers. 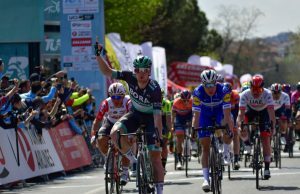 The organisers also hoped that it would help to bring back the glory days of Stephen Roche and Sean Kelly by spawning a new generation of young Irish cyclists. The Tour was starting later than normal that year, as it didn’t want to clash with football’s World Cup which was being held in France, and would see the hosts triumph for the first time. It was a good decision in retrospect by the organisers as it would undoubtedly have taken a lot of attention away from the race. Unfortunately, there was much controversy before the race even started. In the months before the Grand Départ, there were threats of industrial action by the Gardaí. They had already gone on strike at the beginning of May demanding higher wages, and there was talk of another strike happening when the Tour was due to start, at a time when they would be needed to work on road closures. In the end, it didn’t come to fruition. However, he later contradicted himself somewhat by saying that “we are going back to France for their schooling. However, I don’t want to take back what I said either. In Ireland, there is a great lack of facilities for the kids and sport discourages them from drinking. Last year when the Junior Cert results were out, I heard the radio crying for parents to keep their kids away from drink. You go down to Temple Bar any night of the week and you’ll see it. I think it is very true that the kids need something more to do than just going down to Temple Bar and having a drink. But I am not leaving the country because of that, that’s anywhere in the world,” he said. However, these were just minor distractions compared to the controversy that was brewing. On the Wednesday before the race started, a soigneur for Festina, one of the teams competing in the race was stopped at the border of France and Belgium. Willy Voet’s car was searched by customs officers and found to contain 234 doses of EPO, 80 flasks of human growth hormone and 160 testosterone tablets. He was arrested and taken to a nearby police station for questioning. Voet was later charged with “smuggling of illegal merchandise and movement of said merchandise.” Word soon reached Ireland of the arrest. Back in Dublin, at the team presentation at Trinity College on the Friday evening, Bruno Roussel, the manager of the Festina team was asked by journalists about the breaking news of the alleged arrest of a soigneur, but he described the news as “a bad joke” and stated that no members of his team personnel were missing from the hotel in Dublin. Following on from the team presentation, there was a reception at the official residence of the Irish President, Áras an Uachtaráin in the Phoenix Park, and amongst those who attended was Roussel. He mingled and chatted with various acquaintances he knew from the race and at one stage caught the eye of Marie-George Buffet. An Irish soigneur working for the US Postal team, Emma O’Reilly would later reveal that Festina were far from being the only team involved, and the scandal might possibly have been even bigger but for her intervention. O’Reilly had travelled home prior to the Tour to visit her family in Dublin, and she then planned on meeting the US Postal team personnel as they arrived off the ferry at Dublin Port. “I knew obviously there would be stuff (drugs) on the trucks but definitely the main reason was that I was trying to explain to the customs that they had never met or dealt with a crowd of grumpy and angry mechanics from Belgium and France.” She went on to say, “When the race left Ireland for France the team became concerned the police would search other team vehicles following the Festina drug seizure. 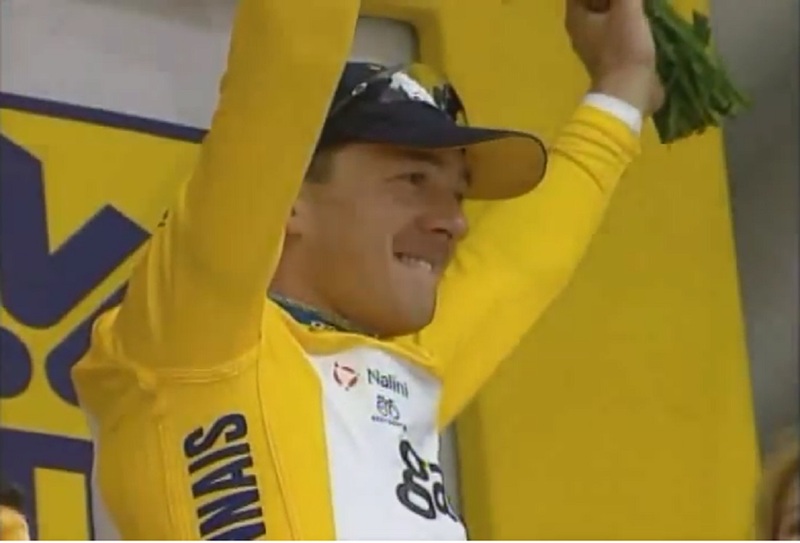 With such a short prologue, the gaps were always going to be small and so it proved to be as Briton Chris Boardman won by just four seconds from Spaniard Abraham Olano, with Laurent Jalabert another second back. Christophe Moreau was the best of the Festina team in fifth place. Boardman’s average speed was over 54 kilometres per hour, and it was his third prologue win in just five years. His win came despite not feeling great, as he said afterwards, “I really didn’t expect to win today. I didn’t feel very good this morning, but it came right on the day. The crowd really helped. The noise was incredible. Today I remembered the reason why I ride a bike.” A number of other riders had also commented on the size and enthusiasm of the crowd around the circuit. The next day, the riders would have to travel on a circuitous route through the garden of Ireland, County Wicklow, before returning to Dublin. 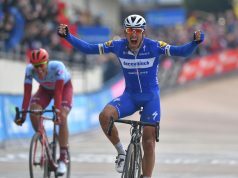 Festina rider Richard Virenque had also appeared nonchalant at the sign-on in O’Connell Street that morning, as he went up on stage wearing a French football jersey in support of the national team who were playing in the World Cup final that evening. The Festina team were presented on stage as the leaders of the team competition and it was to be the only highlight of the Tour for them as the wheels started to come off for them. On the stage that day, an early breakaway of seven riders including Boardman’s team mate Jens Voigt had gone clear near Arklow and they stayed clear for most of the day. 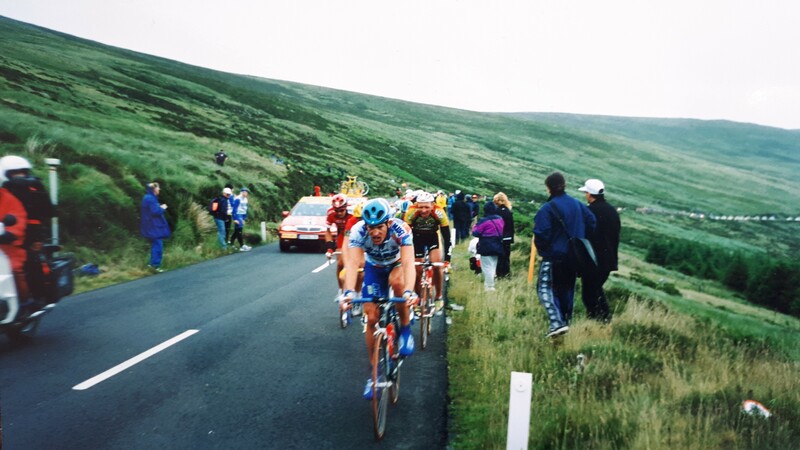 McQuaid had predicted that there would be fireworks at the top of the main challenge of the day, the Wicklow Gap, but it turned out to be something of a damp squib for the thousands of spectators who had gathered there. 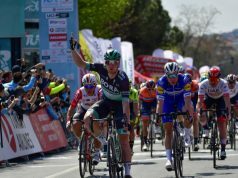 Apart from the break, the peloton remained gruppo compatto and didn’t split up as many expected. The leaders were reeled in with 20 kilometres remaining and it looked like it would end up in a bunch sprint in the Phoenix Park. The Italian sprinter, Mario Cipollini who had finished in the top twenty in the prologue stood a good chance of taking over the yellow jersey from Boardman. 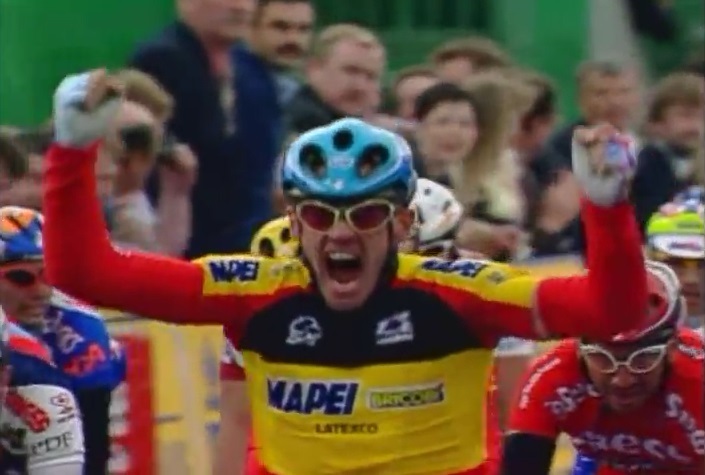 The stage was won by the Belgian, Tom Steels who just managed to come past Erik Zabel in the last few metres. Chris Boardman finished in the bunch so managed to hang on to his yellow jersey. 2 Erik Zabel (GER) Team Telekom s.t. 3 Robbie McEwen (AUS) Rabobank s.t. 4 Gian Matteo Fagnini (ITA) Saeco s.t. 5 Nicola Minali (ITA) Riso Scotti-MG Maglificio s.t. 6 Frédéric Moncassin (FRA) GAN s.t. 7 Philippe Gaumont (FRA) Cofidis s.t. 8 Mario Traversoni (ITA) Mercatone Uno s.t. 10 Jan Svorada (CZE) Mapei s.t. Boardman said afterwards, “After my win on Saturday I didn’t expect it. Coming over the Wicklow Gap I got a great reception and we’ll have to wait and see now if I can hold onto to it. It was a shame for Cipollini to crash, but it worked out quite well for me. I’m not surprised there was a crash, in the first few days of the Tour all the riders are very nervous. People are prepared to die to win a stage, and while everyone still has fresh legs and are battling for extra points by finishing in the top 20, something has to give. That’s the Tour I’m afraid. I kept well placed throughout the stage and it was fortunate that the conditions were dry for me again. There was a perfect head wind and tail win for us. The next stage will be just as hard. All the contenders are very, very motivated and very good at what they do.” Unfortunately for Boardman, there would be more crashes the following day. Meanwhile, Jean-Marie Leblanc sounded like he would have preferred if the issue was just swept under the carpet, as he said that the problem was of no concern to him or the Tour and that it should be left to the authorities to sort out.